Exploring Surrey’s Past (ESP) is an exciting new online resource (funded by the HLF) which aims to promote the social history, archaeology and heritage in Surrey and is supported by a programme of outreach learning programmes and workshops. The site is a must for anyone who wants to know more about the history of where they live and their community in the county and for teachers the resource can be used in the classroom, with strong ties between Key Stage 3 History and ICT learning. 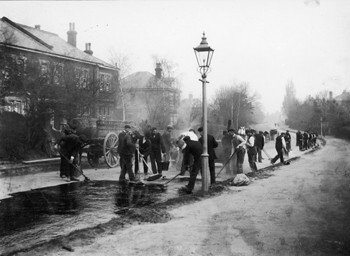 Created by Surrey Heritage (part of Surrey County Council) and its partners, www.exploringsurreyspast.org.uk makes available thousands of records related to all aspects of Surrey’s history and archaeology. You can see historic images, find out about archaeological sites near you, and read pages contributed by people from all across the county. A forthcoming feature will include oral histories and more content is being added, and new information being sought all the time. The website is a mine of information about archaeological sites, chance finds, historic buildings and landscapes, taken from Surrey’s Historic Environment Record. It allows you to search the archive collections of Surrey History Centre, which hold information on a huge variety of businesses, institutions, families and individuals relevant to the history of the county – a resource spanning 10 centuries. Several museums are also making information from their collections available on the website, some including images of their objects. Additionally, North Tandridge Local History Centre, based in Caterham Valley Library, has contributed a collection of digitised old images, to let you explore the local history of their area. You can read about the local history of your area in articles written by local people, see pictures of ‘then’ and ‘now’ and explore some of the key sites where you live. You can find out about the famous people who have lived in Surrey, and see how Surrey has changed through time. Not only can you explore the site for information, but you can also have your say. The website invites you to comment on examples that mean something to you, and you can add your own local knowledge, pictures and memories to help build the website up. The vast majority of content on the site has been written by local people. The have written introductions to local history, overviews of some of the key sites where they live and about famous people who have lived there. A wide range of volunteers have also been busy behind the scenes, adding to, enhancing and checking our records before they get published online. Many have been working with digitization projects, some with photographing sites and buildings, others recording and photographing objects from museums. Exploring Surrey’s Past is also on the road, visiting libraries and other community centres, where the project team will be on hand to demonstrate the website and answer questions. A travelling exhibition will also be touring around the county in 2008. 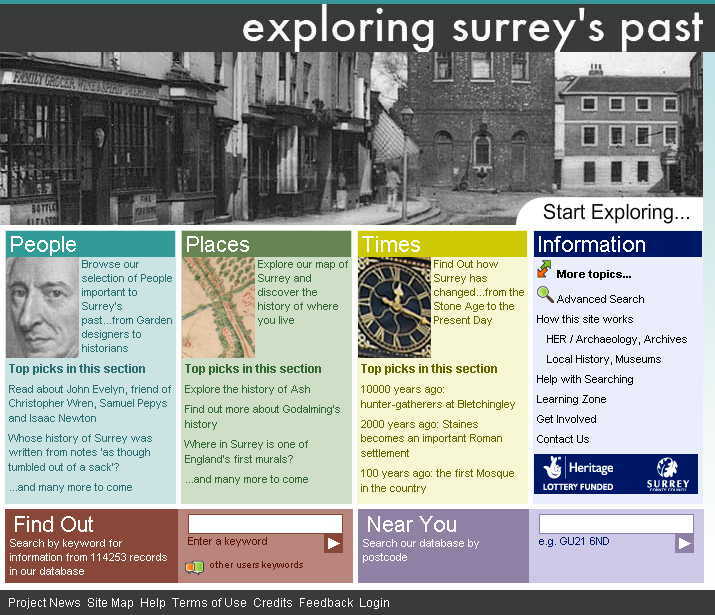 So visit www.exploringsurreyspast.org.uk to start exploring near and far – down your street or anywhere in Surrey. And don’t forget to tell us, and the rest of the world, what you have found out whilst exploring your local history and archaeology. This archive entry was last updated on 2 June 2014. Information incorrect or out-of-date?